AK: Congratulations: after seven rounds you are in the lead. What are your chances to win the tournament? NS: I’m in a strong position but winning will require a lot of concentration in the last two games. So far things have been pretty good. My performance has been fantastic. I could not hope for more. I could hope for 100 percent but I’ll take 6.5 points out of seven games any time. AK: What has been your most interesting game? NS: I think that would be the complicated game I played in the fifth round against the Chinese player Liu Qingnan (Click here to view the game). AK: Besides you, there are other top players in the tournament, among them Women’s World Champion GM Hou Yifan and the GM Jan Gustafsson. What have they brought to the world of chess that stands out? NS: I think Hou Yifan is a huge star. Everyone is still talking about her performance in Gibraltar, and rightly so. She’s young, female, and very talented. She’s even younger than my daughter! She’s a really nice person too and a huge asset for a tournament like this. It’s ok to have the oldies like myself, but there’s also something very exciting about having some young blood here. 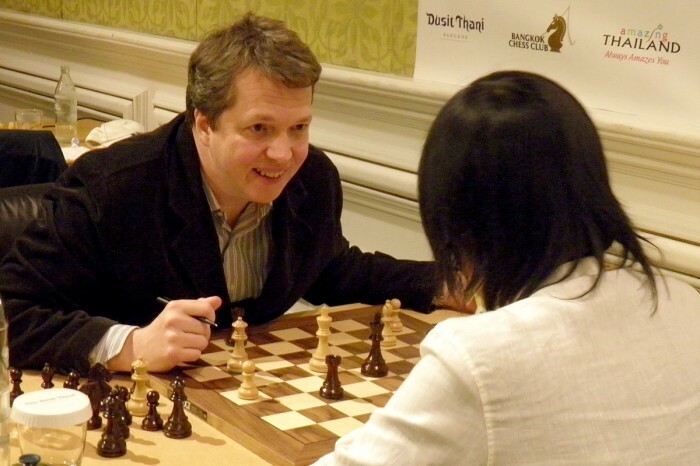 Gusti is a decent and highly respected grandmaster. He played very well in the European Team Championship, won by Germany. So that’s another distinction that he has. But here Gusti’s not quite in his best form. It goes like that sometimes. Last year everything went fine, but this year he has already dropped two points. Although he can still finish well I don’t see him winning the event. AK: Do you follow any rituals or a routine before and after every game? NS: I try to keep to some sort of routine, but it’s flexible. Today I was a bit annoyed because I overslept. That knocked me a bit off balance. Now we are at the business end of the tournament, so the preparation comes in much more seriously, whereas when you’re playing double rounds there is no chance to do meaningful preparation. I’m hoping they will do something about it. I bet with nine rounds on nine separate days the tournament would break its record of attendance. AK: By now you have come to Thailand four times already to compete in this tournament. What are your impressions of the playing locations Pattaya and Bangkok? What do you think about the Thai people and culture? NS: The tournament is very nice indeed. This is a historic hotel and far superior to the vast majority of tournaments I have played. I love it here. That’s why I keep coming back. It’s not only the country, though. I like the organizers. They are very friendly people. The Thai people are great too. People on the streets are friendly and everyone is welcoming. I think that this is the best tournament in the world for amateur players because of the location and playing conditions. When I look at the tournament purely from the perspective of a professional chess player, I would like to see a bit more money go into the prize fund. 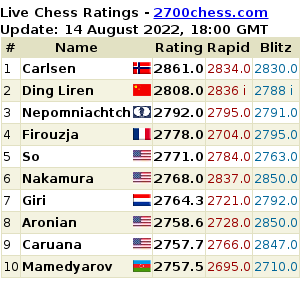 AK: At the age of 46 you are the oldest player in FIDE’s top 100. How is that possible? Is professional chess a game for young people? NS: Yes, for kiddies. It’s very much a game of the young players. But I subscribe to the theory of John Nunn. Many years ago he said to me that while the brain does rot, the most important thing is motivation. This accounts for a lot. People get married, have kids, and change their priorities in life. So working hard on your game becomes less and less appealing. I think that this is the problem that most people have. When you lose the appetite, you stop working, your results go down. Therefore, you get less enjoyment out of chess, you work less, and your results go further down. You get into this death spiral. NS: He’s the exception to the rule. AK: In recent years computers seem to have become indispensible in chess. Young players may be at an advantage because they know how to use computers effectively. In what ways do you rely on the help of chess programs? NS: My view is slightly different on this. The programs that we have now don’t require great technical skills. You are doing a search on some reference – you hit a button. It’s not like in the old days where you had to make a file. There was an entire procedure, it was complicated and boring. But now, everyone can use it. The technological gap has narrowed considerably, and I also use the computer effectively in my preparation to make an assessment of my opponent’s play. I’ve read an interesting remark by Kramnik recently. His opinion was that it is very difficult to get a big advantage in the opening these days, especially because people are using these analysis engines. He thought that chess was moving much more towards playing ability. When there’s a democratization of information – which we’ve got these days – everyone has their Houdinis or Rybkas. That’s why players have to be more versatile these days. I’m not really a d4-player, but I played d4 today. I’ve been doing a lot of this stuff recently, and with pretty good results, actually. It helps me to present a moving target rather than a sitting target when I play. AK: You have published a couple of books on chess and a DVD. Are you planning any further publications for this or the next year? NS: No. I’m not really a writer. My idea of doing a DVD was in lieu of doing a book on my best games. In fact, I have done columns for a number of years. And now I write about 1500 words for each issue of New in Chess. I’m quite enjoying it. I was asked by Schach Magazine to write an article about this tournament – I guess they will translate it for me. AK: You live in the beautiful city of Athens in Greece. What made you decide to move to Greece? NS: My wife is Greek. Greece is a lovely country. It has many positive things about it but right now the mood is down. The economy is seriously struggling. The unemployment rate, especially the youth unemployment rate, is at over twenty percent. But the Greeks caused the problems themselves and now the bill has arrived. However, many of the people there do not deserve having to pay the bill too. There are still plenty of reasons why I’m staying in Greece for now, but my center of gravity is shifting back to the UK. I bought a flat in London last year and my daughter studies there. AK: Are you interested in coming back to Thailand next year? NS: Yes, as long as things are kept up to standard I would like to come back. AK: Thank you very much for your time. I wish you all the best for the final rounds. NS: Cheers! Thanks a lot.